You can’t get Bruce Lee abs if you don’t push your body to the max. Start with this intensive abdominal workout and build a strong core and a powerful six pack abs. 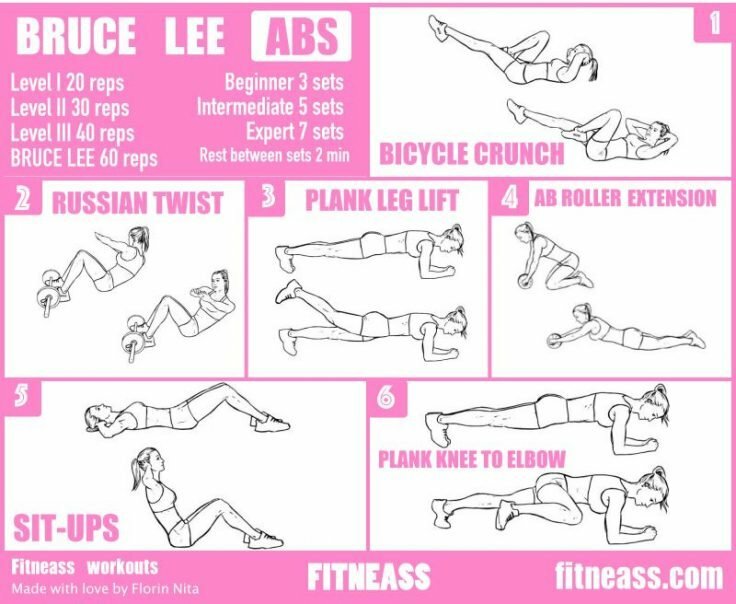 As Bruce Lee said, the stronger your abdominal muscles are, the more powerful movements your body can do. We agree! We all know Bruce Lee as an explosive martial arts fighter. So in order to get those Bruce Lee abs, you need to work out at high intensity, as fast as you can. Also, a progressive method for your reps is recommended. Start with 10 reps for each exercise. Do all 6 exercises without rest in between them. Rest for one minute and start over, but this time aim for more reps than in the previous set. Do the same with the third and the last set. Set I: 10 reps x 6 exercises. Rest 120 seconds. Set II: 15 reps x 6 exercises. Rest 120 seconds. Set III: 20 reps x 6 exercises. Start with 20 reps for each exercise and perform them without rest in between. Catch your breath for 2 minutes and start over, but this time aim for more reps than in the previous set. Do the same with the third, the forth and the last set, because as an intermediate you should be able to perform 5 sets. Set I: 20 reps x 6 exercises. Rest 120 seconds. Set II: 22 reps x 6 exercises. Rest 120 seconds. Set III: 24 reps x 6 exercises. Rest 120 seconds. Set IV: 26 reps x 6 exercises. Rest 120 seconds. Set V: 28 reps x 6 exercises. Start with 30 reps for each exercise and perform them without rest in between. Catch your breath for 2 minutes and start over, but this time aim for more reps than in the previous set. Do the same with the next sets, until the last one. You should be able to perform 7 sets, because you’re an expert, right? Set I: 30 reps x 6 exercises. Rest 120 seconds. Set II: 32 reps x 6 exercises. Rest 120 seconds. Set III: 34 reps x 6 exercises. Rest 120 seconds. Set IV: 36 reps x 6 exercises. Rest 120 seconds. Set V: 38 reps x 6 exercises. Rest 120 seconds. Set VI: 40 reps x 6 exercises. Rest 120 seconds. Set VII: 42 reps x 6 exercises. Rest 120 seconds. If this isn’t enough for you, you can try to “beat” Bruce Lee by performing 60 reps for each exercise. Also you can add a set or two to make it more challenging. For this challenge you will perform about 500 reps for each exercise, 3000 reps in total. Can you do it?